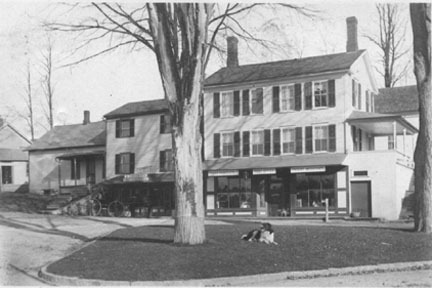 These buildings were located at the corner of Main and Church Streets, and would now be recognized as being at the corner of Route 15 and Lee River Road in Jericho Corners. Although hidden by the tree in this photo, these are actually two separate buildings. On the left is the Chesmore Block, so called, which was in use as early as the 1850’s as the home of L.F. Wilbur. About 1876, Spafford Wright had a carriage manufacturing business here. Later, a store was operated by Samuel Clark and A.A. Chesmore. The building on the right was reportedly used as a post office as early as 1798. By the 1860’s, if not before, it was also being used as a store. It was run by Harlow Percival from 1870 to 1892, then E.W. Curtis, and starting in 1896, by E.B. Williams. Both buildings burned in November, 1906. About 1935, Harmon and Agnes Howe built a luncheonette from bricks salvaged from the servant’s house at the Galusha place around the corner. It has been a private residence since the 1940’s, and is currently home to Mr. & Mrs. Stanley Knapp. At the extreme left of the photo can be seen some of the “Reporter office”, where A.D. Bradford published the Chittenden Reporter.